If you are like me (and, hopefully, you are not), you can't create recipes on the fly. Snack Girl is mired in lists when she goes to the grocery store. Some people can just create great food by seeing what is fresh and knowing how to create amazing taste combinations. I have met these people (one of whom worked for Rachel Ray) and they blow my mind. My memory isn't very good, but even I can remember three ingredients. 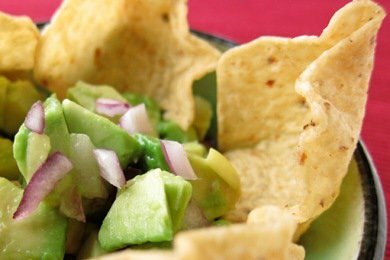 This avocado salsa is made with just an avocado, red onion, and lime (and salt which you don't need to remember because I am sure you have it). It is so simple and delicious and you can remember it when you go to the store (bonus!). Of course, I really love the fresh salsa with tomatoes, onions, cilantro, and chiles - but, tomato season is months away and I will NOT make sub-par salsa. And now, for an exciting change of pace, I am going to say something nice about Frito-Lay. Last year I flamed them with this post: What Everyone Needs to Know About Tostitos. A reader then pointed out to me that Tostito's SCOOPS are great because you can get a lot of healthy salsa on the chip and you eat fewer chips and more salsa. Basically, the scoop is a delivery device for healthy vegetables (like pizza) and I have to agree. You can scoop a good serving of the healthy stuff on these chips so I have decided to give them the Snack Girl stamp of approval (which comes in blue). Just don't eat them without anything else because then they are just empty calorie chips. Have you made a three ingredient salsa? Please share. Chop 1/4 cup red onion and avocado. Mix in bowl and squeeze one lime over mixture. Salt to taste and serve immediately. Since we live on an avocado ranch and grow them, we use avocados daily. Our children have grown up experimenting with various combinations. An easy one: grate a sweet onion, add small chunks of perfect ripe (not mushy) avocado, season to taste with salt, pepper, garlic poweder. We use a seasoning called "Ben's Blend" that is delicious...eat on crackers, chips, flatbread, carrots, celery, etc. It's hard to beat avocados. Hi Snack Girl - I know you said there will be no sub-par salsa in your house and you will be waiting to make your own until tomato season, but... Check out Pioneer Woman's Restaurant Style Salsa - it is fabulous even though it is made with canned tomatoes! Plus you can make a ton for cheap, esp good if it goes down the hatch as fast as your avo salsa! And the way it goes at my house. Plus you control the ingredients! Add more onion, less onion, no cilantro, etc. It gets us through the winter. Actually most of the year. As for your avo salsa, I made some this week too and just used avocados, lime juice, salt, and a dash of cumin - my secret ingredient. Sometimes I add chopped cherry tomatoes too. I knew I should've bought an avocado yesterday while I was at the store! !